THOIA has your first look at the upcoming comic book (formerly known as “Scary”), now with a haunting new title, and erupting from the Golden Age grave of precode terrors– it’s HAUNTED HORROR #1, in stores October 2012 from IDW / Yoe Books. Yoe Banes, the co-editing team that brought you ZOMBIES: The Chilling Archives of Horror Comics Vol. 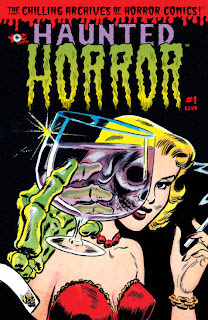 3 collection, present an ongoing, monthly series of unnerving classics, with issue #1 featuring revolting tales from Bernard Baily, Joe Simon, Jack Kirby, Jack Cole, Jay Disbrow, C. A. Winter, and more! 48-pages of FULL-COLOR frights! Stay tuned for more info!